Are you thinking about granite? More and more people are turning to granite as their choice for a countertop and you should too. Not only do these last longer, they look better, they will increase the value of your home and you will be happy to show them off to your friends. Did you know that granite countertops also have one of the longer warranties in regards to a countertop? I mention this because some people don’t think the warranty is that important when the truth is that it is very important. 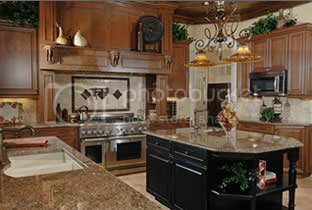 Never Buy Used – The problem with buying used granite is that you don’t know much about it. Some granite will start to fade if not taken care of and others will be cracked in certain places and if you didn’t know what the granite looked like before, then you won’t notice a crack until it changes. Know What Your Buying – If you don’t know much about granite, then you need to either learn or buy from a trusted seller. This will greatly benefit you because some granite yards will try to take advantage of people who don’t know much about it and are just looking for a deal. Take Your Time – The last thing that you need to do is just take your time. Some people try to rush into buying the first granite countertops they see and that doesn’t work. Even if this is the deal of a lifetime, take your time as this might not look right in your house or it might not be big enough to cover your entire counter. If you want to buy the best granite countertops around, then you need to take your time and make sure you choose the right ones. There are a lot of different types of granite out there and the decision that you make will have a huge impact on the way your countertops look.